EFFECT: The magician removes a card from a blue backed deck, shows it and then slips it into a pay envelope. This card is a prediction and can be seen inside the envelope as this has a hole cut right the way through it. A card is now chosen by a spectator from a red backed deck but unfortunately it does not match the prediction. However, when the prediction is removed from the envelope, it has changed to match the selection. REQUIREMENTS: 1. A See-Through Switch Envelope. 2. An accompanying card, say the 5C. 3. One blue deck (the backs matching the 5C). 4. One red deck. PREPARATION: Having prepared the 5C as detailed on p.6, slip it face up inside the envelope which will then appear empty again. Remove the duplicate of this card (5C) from the blue pack and take another card, say the JS, and placing it on top of the 5C, slip them together into the centre of the pack. The JS from the red deck is on top of the red pack. PRESENTATION: Picking up the blue pack you say you will remove one card as a prediction. With the faces of the cards towards yourself, quickly run through the pack until you come to the JS. Cut the JS to the top of the pack, the 5C still being directly beneath it. Turning the pack face down and holding it in the dealing position in the left hand, double lift the top two cards to show the 5C. This, you state, will be your prediction. Double lift the two cards, turning them face down onto the top of the deck. Deal off the top card face down onto the table. This will be the JS, leaving the 5C on top of the pack. Place the pack aside. The left hand now picks up the envelope, holding it by the sealed bottom end, flap side towards you. You point out to the audience that the envelope has a hole right through the centre, thus enabling anything placed inside to be seen. As you say this, the right hand opens the flap and pushes its first and second fingers right down inside. Fig. 43. The fingers will fill the envelope and give the impression, without you actually having to say so, that the envelope is empty. Withdraw the two fingers (taking care not to pull the fake 5C out of the envelope with them!) so that the envelope is once again being held at its base by the left hand. With your right hand, pick up the tabled card, turning it so that its face is towards you and away from the audience, and insert it into the envelope. This card must go BEHIND the 5C already inside and the best way to ensure this is to push against the rear of the envelope as the card is inserted. Fig. 44. This causes the 5C to bend forward slightly so that the JS is fed directly behind it. The audience sees the card they believe is the 5C going inside the envelope and once inside its back can still be seen through the hole in the centre of the envelope. You ask the audience to keep an eye on the prediction and to remember which card it is. 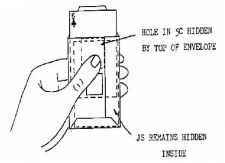 As if to remind them, the left hand regrips the envelope so that the hole is temporarily covered. Fig. 45. 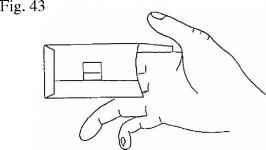 The right hand reaches inside and pulls up the 5C until the position in Fig. 46. is attained, at which point the left hand lowers to display the face of the card to the audience. With the card in the position in Fig. 46 the JS remains hidden inside the envelope and the hole in the centre of the 5C is also covered by the top of the envelope. 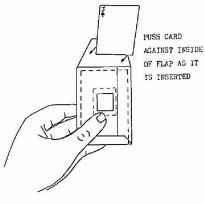 Once the face of the 5C has been seen, raise the back of the card and envelope to the audience and with the right hand push the card back inside, leaving the envelope then flap side down on the table. The red pack now comes into play. Force the top card, the JS, on a spectator and have him place the card, without looking at it, on the table. You can build up the effect by stressing the freedom (?) of choice, how you made the prediction before he chose his card and so on. Eventually he turns over his card, and it is not the 5C, which is apparently what you thought it would be. However, a little extra magic from you will change the prediction. A snap of the fingers and you flip the envelope over. 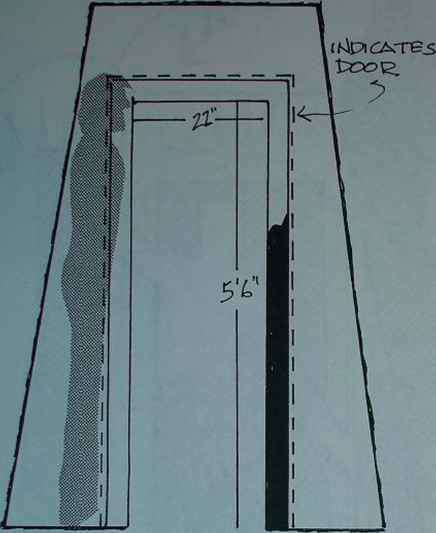 Immediately the centre of a court card will be seen within the envelope through the hole in the flap side. The left hand grips the base of the envelope while the right hand goes into the top and slides out the rear JS card, leaving the 5C still inside and the envelope apparently empty.